Formed during 2009 Ending Quest is a three piece old school death metal band from Stockholm which has just released its debut full length album “The Summoning” via German label FDA Rekotz. 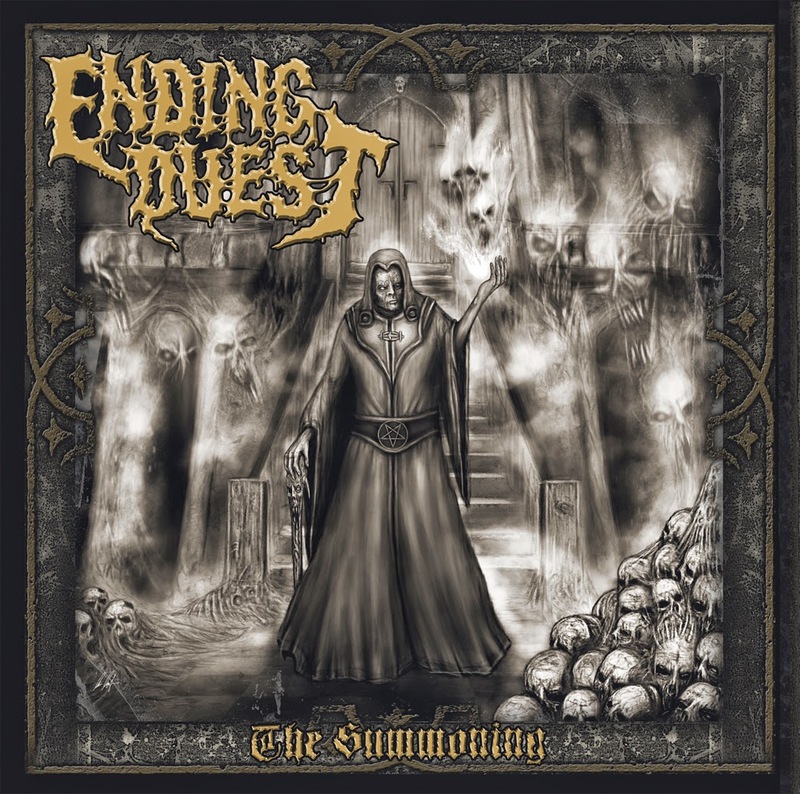 Ending Quest was originally formed by Gustav Gunnarsson and Stefan Nordstrom (both also members of Desolator and Soliloquium) as a non-serious side project to play a few cover songs but eventually turned into a more serious proposition with Jonas Bergkdist joining on bass. 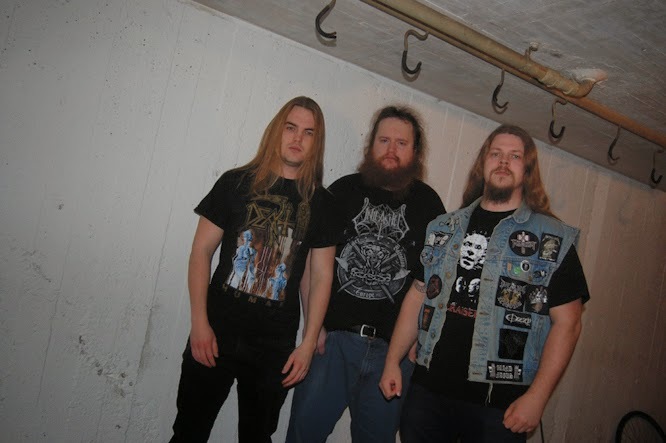 The band’s name is a tribute to Gorement’s album of the same name; a demo entitled “Led to the Slaughter” was released in 2010 with another demo called “The Vlad Tapes” following suit in 2011. The band’s sound features the familiar HM-2 guitar “buzzsaw” sound and the fact they included a cover of Entombed’s Wolverine Blues on the Led to the Slaughter demo is testimony to the sound they set out to achieve, an old school death metal sound most familiar to fans of Entombed, Grave and Gorement. From the strike of the first chord its blatantly obvious Ending Quest have managed to achieve an old school classic “Stockholm Sunlight” sound but if you’ve any doubt as to where you are these are blown out of the water after a minute when there’s almost as much groove as there is buzz-saw guitar work. At least Ending Quest aren’t hiding this fact and wear their influential hearts on their sleeves; proudly declaring this sound as one of their main musical aims, and why not? After all, good music played well can’t be denied no matter whom it’s played by or in which decade, and I feel there’s some room in the playground of death metal for bands with an old school sound, as long as the music is well executed and doesn’t piss over bands or legacies from the past. Track four Evocation of Carnal Flesh stands out due to its guitar solos and background piano track that sits well within Ending Quest’s sound, another track with which we can draw similarities with Wolverine Blues era Entombed is Grotesque Abolishment which again grooves like a champion, there’s also a tidy little bass led section towards the tracks conclusion. By and large this is quite a solid album and granted, there is a significant degree of Entombed and Grave worship going on here but could Ending Quest have picked a better altar to kneel at? The Summoning may not be dripping with the originality some naysayers may seek but it is brimming with authentic, genuine death metal that in my humble opinion never grows tired or old and Ending Quest have applied enough of their own flare and touches to stop this release falling into the retro pitfall that so many bands fall victim to – a steady enough release played with passion, respect and commitment for those seeking an authentic early Swedish death metal vibe that doesn’t rip anyone off.